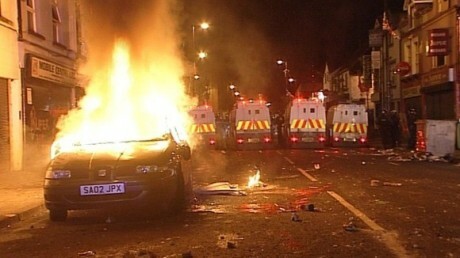 Once again violence has flared across Belfast and other parts of the north as protests continue around the flags issue. The latest disturbances come as Stormont Assembly leaders, Peter Robinson and Martin McGuinness meet to discuss another wave of street protests, and their concerns about the damaging effect it is having on the economy leading up to the busiest shopping period of the calendar. But as each issued a separate statement calling for protests to come to an end, loyalist gangs flexed their muscles, blocking off streets and hijacking cars.